Peach Flavor leaves a statement in every application. Enjoy the memorable peach flavoring experience. Perfect use for delicious peach ice cream, cakes, beverages and drinks, moonshine, and more! Type: Peach Water Soluble Flavoring. Ingredients: Natural and Artificial Flavoring, Propylene Glycol and Ethanol. USP Kosher Grade Flavoring. Usage Rate: 15-20% for E-use. Flavor Suitability: Suitable for baked goods ice cream, cakes, beverages and drinks, moonshine, and more. Specific Gravity: 1.02 No Refunds on Flavoring. If you like peach, this is for you. I admit, it is a good flavor - if you like peach. I wanted a smooth, subtle peach and this definitely was not it. I gave almost a full bottle to a friend who loves peach, because it's just too strong. Even a few drops in a 30ml you can tell it's there. Like the other reviewer said, by itself it's a bit dry, but as a mixer it can be nice. I tried it with creams, butterscotch, cheesecake, vanillas and random flavors to try and find a balance. End the end, the peach always won out over the others. This is a VERY natural peach flavor, alone at full strength it's a bit dry, but it's flexible. Add sweetener and it's a juicy peach, and you have to lower the % because it develops quite a bit more body and flavor when steeped. Lowering the % around 5-6% as an additive it gives tobacco and other flavors a solid peach tone. 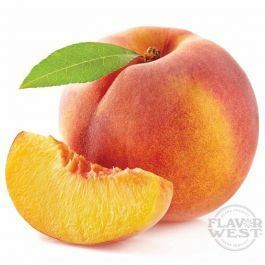 It took a little experimenting to come up with our Peach Cobbler and irreplaceable now; we mistakenly got Peach from the wrong/different source and now I'm here to write this review.